''There are other attendant factors which the buses will not address. 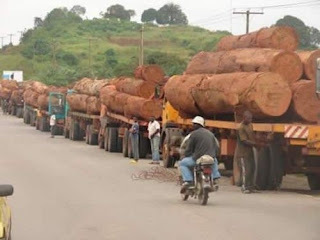 Those are structural problems and the transportation network,” said a staunch opponent of the APC government. While this observation may not be untrue, the government is engaged in a many-pronged approach to transform the country. Civil works are taking place everywhere, with roads including dual carriage ways and bridges being built all across the country. ''A lot of efforts have been put in to open up the city, it will not be a hundred percent, but there are good enough roads on which these buses will ride,’’ he said. The 100 vehicles, manufactured by Zhongtong Buses in the People's Republic of China, will run on scores of Freetown city routes. The buses will do airport shuttles, provincial trips, and serve Fourah Bay College, University of Sierra Leone. For an economy like Sierra Leone’s, where healthcare, energy, and everything else is a priority, the transport sector has been a constant challenge. Overloaded poda podas (minivans) have been a constant on Freetown’s streets. But they may soon be a thing of the past. Travel in Freetown is a hassle. Long queues can be seen from Jui to Calaba Town in the east end to PZ in the center. From Goderich to Lumley, through to St. John , the problems are the same. Thousands of people line up every day, especially during the rush hours. Jeneba Koroma, 16, in junior secondary at the International Mission Secondary School, Wellington, (in Freetown’s East End), said pupils often carry their school mates on their laps in poda podas (mini vans) to defray the high cost of the fare. Marion Kamara, 22, endures a similar ordeal as she commutes from Leicester (a mountainous West End village) to Fourah Bay College. “The drivers charge us more and overload small cars with four or five passengers. Sometimes we have to use motor bikes if we must get to class in time. Either way, it is expensive, inconvenient and unsafe,’’ said Marion. Dora Lewis, a mother and a businesswoman in Wellington, spends at least Le5, 000 daily on each of her four kids for transportation. Dora went on to say that she travels all around the country to buy produce to sell in Freetown. ‘’Sometimes I spend days just waiting for a vehicle that would bring my goods from the interior; in the process my commodities perish. I lose money, it is really tough,’’ she bemoans. ‘’It will be a great relief if government were to alleviate the problem,’’ said Alusine Conteh, 20, a senior secondary school pupil, who has just taken the West African School Certificate Examination. Alusine lives at Thunder Hill in Freetown’s east, but attended tutorial classes in the central part of the city. ‘’By the time we got home it would be so late in the evening and we would be so tired that we had to make every effort to be study at night,’’ he lamented. Other observers say an inability to enforce official fare prices per route/destination have contributed to the hardship inflicted upon commuters. Bockarie Louis Kamara, general manager of the Sierra Leone Road Transport Corporation, agrees. "It has been difficult to fix prices for private individuals or companies or regulate their activities and this is particularly so because there has been no serious competition or alternatives,’’ he said. But some members of the public are skeptical. "Government has been bringing buses, but before you know it, they are either broken or not just available at all,’’ one man said dismissively. Dora, the mother of four is cautiously hopeful. "If these buses are properly managed, I think they would make some difference and I would be very happy,’’ she said. 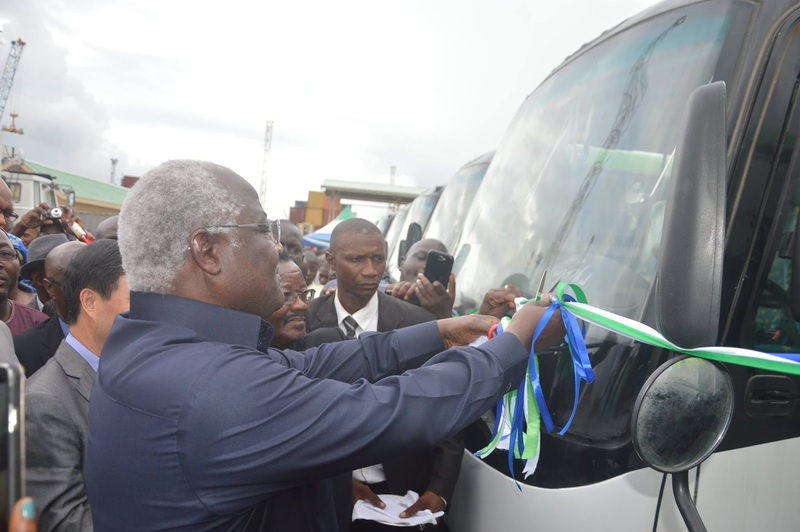 "The buses will arrive on the morning of Monday, July 6,’’ the Minister of Transport and Aviation Balogun Leonard Koroma told me. How would you sustain this project, I asked? "We have learned from past experience. We have spares that would last for three years, two mobile garages, and we have re-equipped the main garage. We have also included a Technical Support component in the project just to be certain that there is an effective and sustainable maintenance and repairs regime,’’ he said. The main garage of Road Transport Corporation -- the agency responsible for managing government's transport -- will serve as depot for the 100 buses. "The ticketing system is so water tight that it makes fraud very difficult. The many franchises we have established across the country will ensure that tickets are easily accessible and sales are properly accounted for. With the demand for the service, we are sure that there will be sufficient returns to keep the project going,’’ the minister said. Kamara, the general manager of the Road Transport Corporation, is confident that the sector would regulate itself. 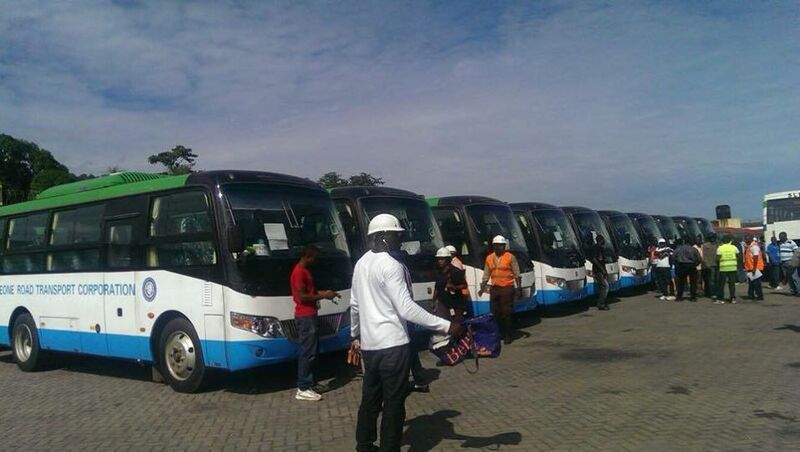 “We have recruited and trained drivers and conductors; established an accessible and transparent ticketing system and deployed sales representatives across the country to serve our people with a customer service attitude,’’ he added. 100 buses for the capital city is a start but spreading a bus network them across the country would be tough and the minister knows all too well. ‘’My vision is for a dedicated national school bus service, a dedicated provincial and inter districts bus service and a bus service dedicated to international routes such as Sierra Leone to Guinea,’’ the minister said. He also acknowledged that this would mean more buses. 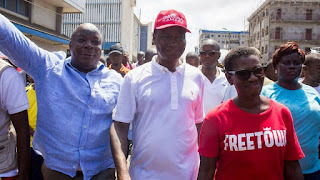 "We have heard the cry, we have seen the inconvenience and we know our people risk their lives and limbs on motor bikes and still others have to pay extra to get to one destination,’’ said the transport minister. “The challenge now,” he went on “is to make sure that there is an organized and safe transport system by which our citizens are conveyed safely and conveniently from one point to the other. We are rising to the occasion to ameliorate the problem,’’ he asserted.